nother way to experience the incredible power of the Zambezi below the Falls is to paddle the rapids with seasoned white water kayakers. After taking receipt of your paddle, life jacket and helmet at the top of the gorge, and an easy walk down to the Boiling Pot, you will receive a comprehensive safety briefing and a practice session prior to commencing your trip. 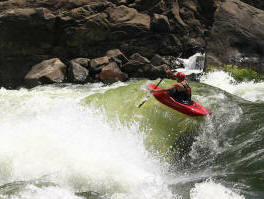 An experienced white water kayaker will steer the boat through the rapids with you adding your support. The trip is run in conjunction with a rafting trip for added safety and it will be up to you, and your personal guide, to ensure that you stay in the kayak or you could end up swimming the rest of the rapid!! Although no previous experience is required, there is a minimum age of 15 years old, a reasonable level of fitness is necessary and there is a weight limit of 90kg. Trips run all year round but the routes may vary slightly depending on water levels. The gorge itself varies from 140 metres to 250 metres deep, making for striking views to compliment the high level of raw excitement. For a full day trip, breakfast and picnic lunch will be provided, and at the end of the day, after climbing back out of the gorge, there is a full braai with ice-cold beers and soft drinks.